Soundtrack is Gokce Kinayoglu’s online interactive project built with the idea of using online maps to create playful soundscape experiences. It brings together the distanced and “objective” bird’s-eye view of the map with the immersive and intimate experience of a stereo sound recording. The technique that is employed involves outdoor sound recordings made on the move ie. ‘soundwalks’, and GPS track-log generated during the walk. 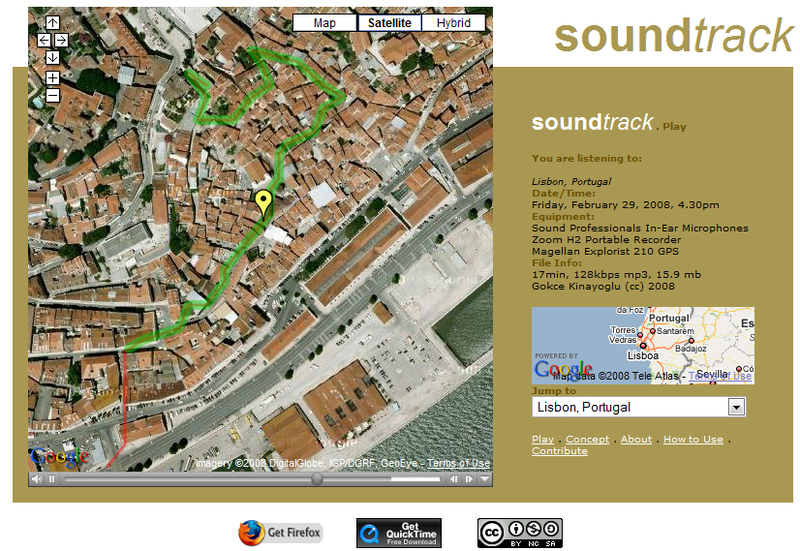 Soundwalk recordings are synchronized with GPS-time series data taken from the track-log. This makes it possible to present the soundwalks as tracks on the map, letting the user explore and interact with the sounds of a place freely through the map interface.